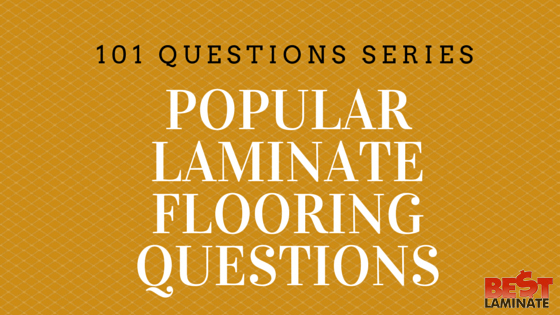 Bestlaminate is here to answer some of the most popular laminate flooring questions. We have 4 new answers to questions that you submitted! 1. As a family with kids and pets, what should we look for when shopping for wood laminate flooring? The AC Rating of laminate flooring is something you will want to look at closely. We carry several brands that offer an AC Rating that is recommended for heavy traffic areas, and even commercial areas. The minimum for general residential use, would be an AC3 rated floor. However, if you have large pets and kids that tend to be bouncing off the walls and floors, you may want to consider an AC4 rated floor. AC4 rated floors are rated for general commercial use, such as stores and shops where there will be lots of foot traffic from customers. This slightly higher rating will usually come with a longer warranty too, since you are purchasing a high quality product. You should read the warranty carefully as it won’t cover some problems, but if you don’t want to pull up your floor in 10 years because it is worn out, consider a floor that offers a 25 year to lifetime residential warranty. If a company is willing to replace manufacturing defect flooring for a LIFETIME you bet they’re sure they have a sound product. Laminate flooring is an investment in your home, one that you will enjoy for many years. 2. Do you have any tips for cleaning my laminate floor? Laminate flooring is known to be low maintenance and easy to clean. A quick sweeping or light mopping is all it takes to maintain your flooring. Use a solution of water and vinegar to mop your flooring. This natural method will kill bacteria and mold, leaving your home naturally fresh and clean. If you want even more tips, read this article to Clean Laminate Flooring Like a Pro. 3. How much extra flooring should I get when buying new flooring? For normal rooms, the golden rule is to purchase 5% extra flooring material due to damaged planks, wrong cuts, and the like. For kitchen installations and when you install laminate tiles, you will want to order up to 10% extra, since flooring may be damaged due to water leaks or other mishaps. Since this wasn’t the first time this question has been asked, we’ve explained what the waste factor is in a previous article. 4. What tools do I need for installation? Laminate flooring is a DIY lover’s project. Many homeowners feel a great deal of accomplishment upon installing a new laminate floor in their home. Keep in mind, each house and installation situation is different. To get a better understanding of exactly what you need, check out our installation check-list! *This post was updated from 2010 to give you a better reading experience! I want to laminate my kitchen floor. should I put the laminate under the cabinets or up to and around them? Hey Doug, you would never want to put a permanent fixture on top of a laminate floor, so butting right up to it would be the way to go. I would need a pad under it ! But we are laying it right over the other floor . Well we had it put down last week ! Heavy on it will ruin in the floor ! Hi Patsy, thank you for your comment and sharing your story. Did you purchase the flooring from us? Typically, laminate flooring does not dent beneath furniture or objects placed on top the floor. Since laminate is a floating floor, pad is required beneath the floor to allow it to float. Please give us a call at 1-800-520-0961, and we can discuss the details of your installation, flooring and the portable dishwasher to identify the problem. Thank you! Can laminate flooring be installed over industrial commercial grade carpet. The carpet is about 1/8″ with no padding underneath? We live in a split level home built in ’94. Radiant hydro heating in poured concrete slabs on both floors. We are looking at putting 15.3mm laminate upstairs. It comes with a foam backing pre-installed. My question is this, do I need to put a vapor barrier down between the concrete and the foam backing on the laminate on the upper floor? Even down stairs, the concrete that contains the piping for the hot water is on top of the concrete foundation. If I were installing this on the bottom floor (which is below grade) I would definitely put a vapor barrier – but if I don’t need to do it upstairs, I’d rather not have to mess with it. Thank you for your question. 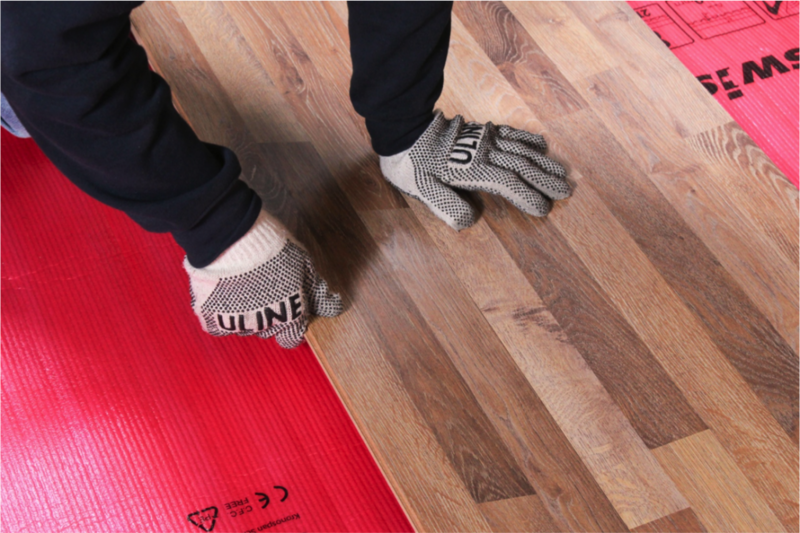 First of all we suggest to contact manufacturer of your floor and check all requirements and rules related to the installation of flooring over radiant heating. Some products exclude this option and void warranty in case you follow with the installation. If it will be one of our floors and installation over radian heating is allowed, we will suggest to use additional layer of vapor barrier over cement subfloor. we want to put a laminated flooring in our livingroom we have wood floors now that aren’t level. How level does the floor have to be. my husband says he doesn’t think it matters if it is no real level but others say different what do u say? Roberta, because laminate is a floating floor the subfloor does not have to be perfectly level in order to install it. The pitch should not be more than an eighth of an inch heighth difference for every foot , you can use a 12″ level to check the pitch. You will need to level all areas that dont fit that criteria, also you may need to scrape or sand down any high spots that you might have in the subfloor in order to level things out. after master laminate my floor in bedrum,the level of the floor lost.what it can be?i suspect that the under pad was install not properly not on surface but in sam places.what can i do?haw can i found out if i am correct? I clean laminate floors for my clients. I use microfiber flat mops and warm water to clean. If I dont mop with the direction of the wood grain, the floor will look smeared. David, There might be residue on the laminate which is causing the floor to look smeared. I’m not sure why it looks better when you mop in the dirction of the wood, we have never experienced any problems with that before. I would suggest to call the manufacturer, they will be able to answer your question more thoroughly. I brought 12mm flooring & my installer is having touble installing it. It will not click together. Put down laminate flooring is not new to him. He has installed many floors with laminate. But this is takeing 4 times as long to put down . Is there any tricks to put it down? Lora, There are many videos that your installer can watch on youtube to help with installation techniques. Laminate flooring manufacturers have many different locking systems and methods of installation. A professionally trained laminate flooring installer should have no problems installing this floor. I have seen many people who say that they are very experienced laminate flooring installers when really they are not and they simply underestimate the work that needs to be done and the time that it takes to install the floor correctly.